While exploring Old House Dreams blog I came across one of her posts that talked about Castle Victorian. I did a little more digging and this is not just any house. 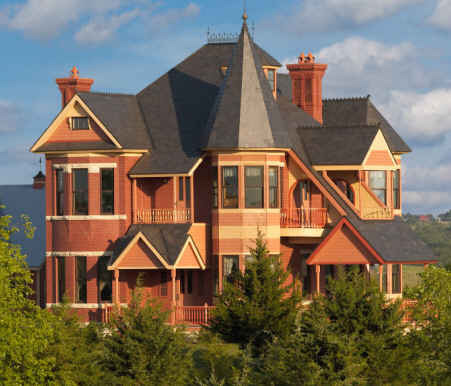 It is a home that was built in 2002 on 60 acres and it was constructed from an 1885 Victorian home plan. The couple made very few changes to the original layout other than modernizing some of the rooms and adding a downstairs bathroom and breakfast area in the kitchen where there was none. They have even stayed true to the Victorian aesthetic in the interior of the home. 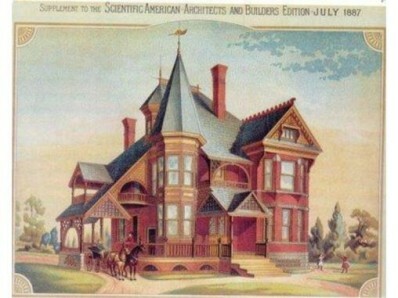 I encourage everyone to take some time and explore this site as it is fascinating and the homes website includes lots of information and pictures of the house from construction to completion. It really is a chance to live in the present while keeping our feet in the modern world. Check out the excellent blog Hooked on Houses as well! 1 Response to "Old is New Again…Castle Victorian"
I too really like the older home site with the photos of the interior and exteriors of the houses that are for sale. It is interesting to see the different price points regionally. It definitly helps you to see what works and what doesn’t. Wow some of those color choices! I suppose they are trying to be historical.